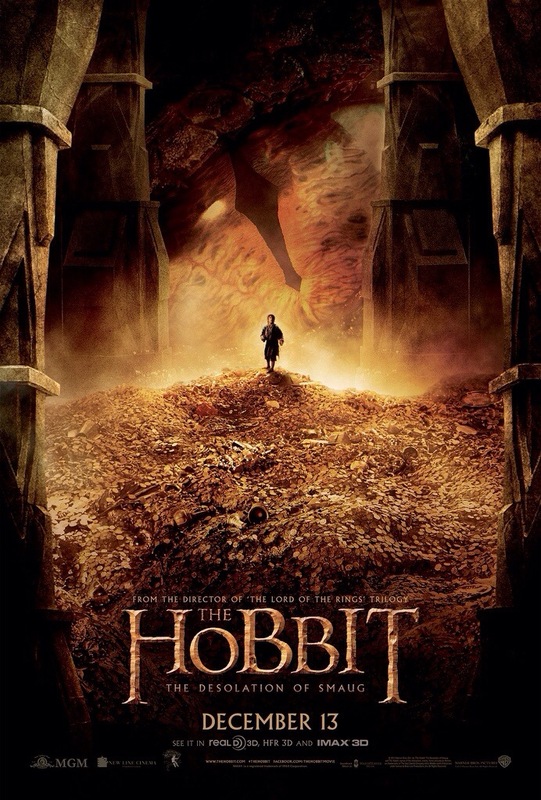 Now fully on their journey to Erabor and the Kingdom under the mountain, Bilbo (Martin Freeman) and the dwarves must find their way through a dark, arachnid filled forest before escaping the clutches of Elfin King Thranduil (Lee Pace) and a horde of rampaging Orcs. All this before they’ve even faced their biggest adversary yet… “the serpent of the north”. With all the character building already established in “The Unexpected Journey” and the omission of the drawn out and, frankly, tedious songs, Jackson finds his feet on more solid ground here. These aforementioned hang-up’s are what hindered the pace of the first instalment but with them now put to the side, we are allowed to enter the fray from the outset which benefits the film immeasurably. Once again, Jackson shows his highly creative abilities in staging an action set-piece and that’s where most of the enjoyment comes from. He introduces some new (and old) characters that really kick things up a gear, especially the inclusion (or invention) of Evangeline Lilly’s elfin warrior Tauriel, who adds a much needed strong female character to the proceedings and Orlando Bloom’s Legolas makes a welcome return. It’s both of these characters who contribute greatly to a high speed river chase that’s one of the film’s most impressive and exciting action sequences. Speaking of which, there are many moments that are marvellously and thrillingly handled; the giant spiders in the forest to Gandalf’s confrontation with the Necromancer and the showdown with Smaug as Thorin Oakenshield (Richard Armitage) storms the mountain to reclaim his throne. Although exceptionally handled they do have a tendency to feel relentless and leave very little room for actual storytelling or characterisation. Martin Freeman is still perfectly suited for Bilbo but there’s so much going on around him that he seems like a side character in his own story. 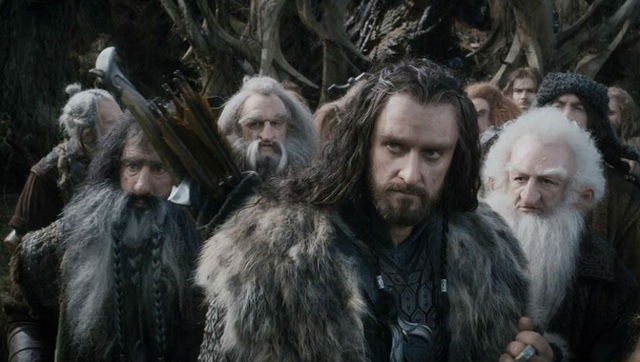 Much of the focus is on the dwarves and even then, very few of them actually get to really bring their characters forth, with the exception of Armitage’s Thorin and the fragility of his strong facade. The absence of Andy Serkis’ Gollum is also a major drawback but Jackson does have an ace up his sleeve with the astounding motion capture of Benedict Cumberbatch as the fearsome dragon, Smaug. 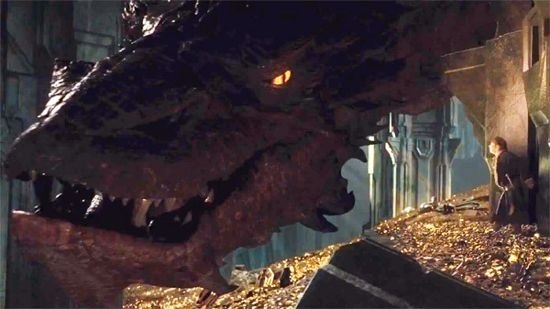 It’s through exploring the darker territory of Smaug or the Necromancer that Jackson’s willingness to gain momentum is apparent. The laborious nature of the first is tightened up and there’s no denying this one’s energy or it’s ability to entertain. Despite being overlong, things are kept very exciting and Jackson maintains your interest right up until the final moment where we close on a blank screen… frustratingly, awaiting part three. But then, this is what we have come to expect with the, sometimes awkward, middle section of a trilogy. Despite some of the criticisms I heard (and shared) about “The Unexpected Journey“, I still thoroughly enjoyed the film and, ultimately, that’s the whole point. It’s escapism of the highest kind. With this being an improvement on that, it still boasts well for the trilogy to go out with a bang, in the way “The Lord of the Rings” done so brilliantly. Trivia: Martin Freeman and Benedict Cumberbatch filmed their roles while on hiatus from their television series Sherlock (2010). Stephen Fry played Sherlock’s brother Mycroft in Sherlock Holmes: A Game of Shadows (2011), while Christopher Lee (Sauron) played Sherlock in two other films as well as playing Mycroft in The Private Life of Sherlock Holmes (1970), which also featured Robert Stephens (Aragorn on BBC Radio) as Holmes. This entry was posted on January 9, 2014 at 3:55 pm and is filed under Action, Adventure, Fantasy with tags 2013. You can follow any responses to this entry through the RSS 2.0 feed. You can leave a response, or trackback from your own site. I’m glad you liked this as much as you did. A part of me wishes I had liked it as you. Alas, I didn’t. I don’t exactly hate it, but I also don’t particularly like it. Anyway, it’s good your experience was more positive. Yeah, I had a lot of fun with this James. It was certainly flawed as the first one was but excellent entertainment. I can’t really fault Jackson too much. He’s doing a good job. Brilliant review. I agree for the most part. I didn’t think it was overlong, I didn’t want it to end. I actually feel this film had significantly more character development than it’s predecessor. I felt like I knew the dwarfs better in this film. 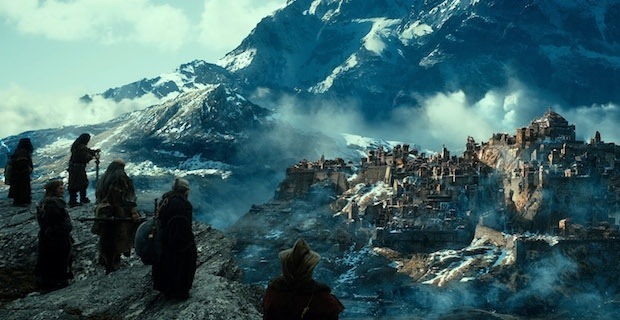 Lastly I loved the songs in The Unexpected Journey, Misty Mountains was phenomenal. Cheers Chris. I did find a bit too long but still really enjoyed it. The characters took a back seat to the action for me, but it’s not a massive complaint and I have to admit, I wasn’t keen on the songs from the first one. I was glad to see them go. I don’t know if I’m 100% in on this one. It’s hard enough for me to sit still for a 90 minute movie…. It’s certainly a commitment amigo but great escapism all the same. I’m a big of Tolkien’s world so this kinda stuff will always appeal to me. Hi Mark! Just upvoted your review on Reddit, glad you enjoyed this as much as I did! Nice bit of trivia too, Sherlock + Watson together as Smaug + Bilbo are one of my fave scenes! Escapism of the best kind for me too, always love to return to Middle Earth. Hey Ruth. Thanks for the up vote. Yeah, great entertainment this one. I enjoy visiting middle earth myself and Jackson done a tighter job on this. It’s was slightly overlong but not quite as laborious as the first. Bravo! Good stuff Mark! I really liked this movie and thought it was a nice step up from the first picture. It had a much grander sense of adventure and the ending was definitely more exciting than the first film. Glad to hear you enjoyed it too! It certainly did have a grander sense of adventure bro! It’s really hard to fault Jackson and his commitment to the overall story. I had my doubts about a trilogy but I’m starting to think he’s done the right thing..
Oh I’m with you. I had big doubts too. But this is really the key film in determining whether his decision was a good one. I think it was! Agreed! Jackson has proven many a person wrong here methinks! Awesome! So happy to hear you enjoyed this one as much as I did! Cumberbatch’s Smaug is incredible and the film really is notches above its predecessor. Excellent article Mark :). I actually liked the first one, Joseph, but there’s no doubt that this a stronger film. 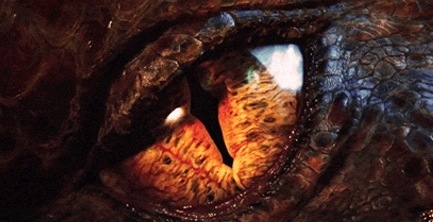 Smaug was something else, wasn’t he? Just superb. Thanks man! Yeah, I had my doubts when the trilogy was announced. I still had them after seeing the first movie but I think I’m sold on it now. Sorry to hear it didn’t work for you Cindy. I can definitely understand your feelings with regards to the first instalment but I thought this one moved at quite a quick pace, despite its length. To be fair, I was a big fan of the books so there is an element of self-indulgence for me. I’m glad you liked it Mark! It was a great review; I like positive reviews more than when all the flaws are pointed out. Thanks Cindy. I couldn’t help but point out a few flaws with the film but overall, it was great fun. I can understand how people have fun with the film and it is an escape and all, but I can’t understand the continually high scores for the film. From a technical standpoint, it’s a mess. The story is dragged out like none other, it’s full of unnecessary scenes and characters, and the CGI looks so damn bad it almost ruins Middle Earth entirely. I’ve said it before and I’ll say it again- Jackson is the new Lucas. Good review Mark. Still feels longer than it should be, but here’s to hoping that not only can Jackson cut-down on the run-time a bit for this next one, but that he can also deliver the same old magic we used to love him for. Cheers Dan. I agree, man. I little less length and padding would go down easier but the action here was good enough to promise a great finish to the trilogy. This was so much better than the first one, which I dozed off in both times I watched it. It was definitely helped by increased action and better pacing. Definitely Abbi. I actually quite liked the first one but it was a bit lethargic. Can’t really say that about this overall though. The action keeps it going. Well written, Mark. I was pretty leery of the run time after seeing the first, but I don’t think I found myself looking at my watch (phone) a single time during this one. I read somewhere that someone described this as less of a tale of a hobbit’s journey, and more of a prequel to LOTR. I think I agree with that after seeing this, and the greater emphasis the one ring has than it does in the books. Love all the additions though that Jackson has placed in there so far. Thanks Gene! This is definitely more like it from Jackson and the whole middle earth story. It is starting to look more and more like the marvellous rings trilogy and that’s always a good thing. I reckon the third one is going to kick it up even higher which will tie in nicely. That’s a good review Mark, and I’m not just saying that because I happen to agree with it wholeheartedly! I enjoyed this a little more than the first one (which I also liked despite the faults). Looking forward to the next one now. Thanks Stu. Coming from yourself and your great writing, that means a lot. To be honest, I struggled a little with this review. I had to really force myself. Nothing was really flowing the way I wanted it to but my opinion still stands regardless of how I wrote it. Can’t wait for the next one now too, though. It’s looking quite good for a strong finish. I did find this one hard to talk about Jessica. I liked the first one even though many had a hatred for it. This follow up is definitely an improvement and easy to see why some wouldn’t take to it. If you let yourself go, though, this does provide the goods. I generally don’t make top ten lists but I still want to see everything before I would even consider such a thought. “Escapism of the highest kind” sums it up nicely Mark. Very enjoyable read as always as great trivia! Indeed, my man! Escapism is the order of the day here and for that, it can’t be faulted. I had a lot of fun and can’t really criticise the film. It’s an achievement in my eyes. Wow! Great review Mark, and I am thrilled to see that you enjoyed it so much. I must admit that I am going to wait for this and won’t be seeing it in theatre, I was really not a fan of the original or the direction that this film’s story arc was in for! Thanks Zoe. I can totally understand you not liking the first one but this does pick up the pace. There’s lots more action to keep you entertained through a lengthy running time. Hmmmm, it will be something that I look into when it comes around. Fair enough. There’s plenty of films to get through before its Oscar time again. I’ve a list as long as my arm. And then some I bet you! Top review mate and pretty much spot on. I just love the world of Middle Earth and I thought this was a definite improvement over the first. It’s still a bit long and padded but I can overlook that. Really looking forward to part 3 now. Cheers Chris. I’m convinced by Jackson’s vision now. I wasn’t after seeing the first one but he delivers the goods here and part 3 is starting to look very good indeed. Great to hear The Hobbit “2” shapes up well. I enjoyed the first film despite Jackson stringing out the material for three hours. I still don’t see why these films have to be so long which puts me off seeing it in the cinema. Yeah, I liked the first one, Dan, but this is still a stronger film. The length is a bit of an issue but still thoroughly enjoyable all the same! Thanks again, Allan. Yeah it does have its faults but it’s a lot more tighter than the first. Here’s hoping Jackson can tighten it up further for the last instalment and go out with a bang.